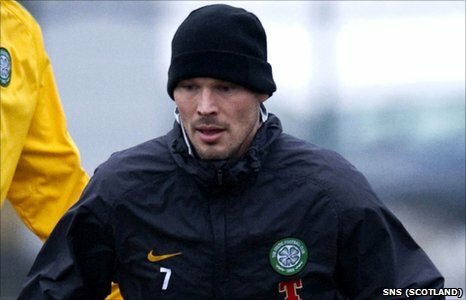 Former Arsenal forward Freddie Ljungberg has passed a medical and agreed a deal with Celtic until the end of the season. The Swedish midfielder is now in line to make his debut at Ibrox in Sunday's Old Firm Derby against Rangers. The 33-year-old has been training with Celtic and boss Neil Lennon said: "He's done very well in the two days we've seen him. I've been very impressed. "I've seen more than enough to know he would be a good addition." Celtic have called a 1000 GMT media conference for New Year's Eve to unveil the player ahead of the crucial derby with their Glasgow rivals on 2 January. Ljungberg, who made his name at Arsenal, is leaving Chicago Fire after an 18-month spell in the United States. "There's a bit of hunger about Freddie," added Lennon. "He's a consistent player and has been for a long time. "He had horrendous injury problems at West Ham but he went to America and got sorted out medically. He's in very good condition." Speaking earlier this week midfielder Niall McGinn, whose place in the team would be under threat from Ljungberg, said he had also been impressed by the Swede. "He is a player I looked up to when I was younger and he looked sharp in training," said the Northern Irishman. "He's a versatile player, he can play on either side and play in the hole as well. "But I'm in the team and it's up to me to stay in the team. The manager has shown faith in me. "You are playing for a massive club and, if the manager brings in players, you have to work around that. "I've been here for two years and I've seen a lot of players leave and a lot of players come in. "I have to make the most of any opportunity I get, but the manager seems to trust me. "I've had a few injuries, but when I've come back, he has shown faith in me and I've done well."